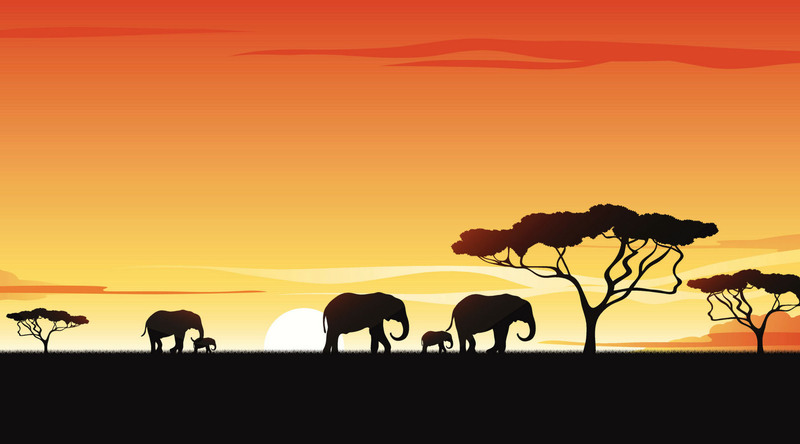 An illustration of African animals in the Savanna. One of the most exciting aspects of a trip to Africa is, hands down, the incredible wildlife you’ll see. And when you cruise to Africa with us, you’ll have plenty of opportunities for it. View all our African cruises here. In Africa, many safari parks and game reserves will advertise the opportunity to see “The Big Five”. Which animals are they talking about? The big five are lions, leopards, rhinoceroses, elephants, and Cape buffalo. The term originated from hunting, as these five animals were seen as the most difficult to hunt on foot. Today, though, the term is more frequently used as a marketing tactic. When you travel to South Africa, you may notice that each note of their currency, the rand, features a big-five animal. Lions live in several parts of Africa, as well as one region in India. Most of Africa’s lions now survive in the Savanna and grasslands of protected areas, in six countries: Botswana, Kenya, South Africa, Tanzania, Zambia, and Zimbabwe. It’s easy to identify male lions from female ones, thanks to the males’ iconic manes. Male lions are also significantly bigger than females. A male lion weighs in at anywhere from 300 to 550 pounds, while a female ranges from 250 to 400 pounds. It’s estimated that there are now around 20,000 lions remaining in the wild, only about ten percent of the population compared to a century ago. Leopards can be found across sub-Saharan Africa, as well as in parts of Asia. There are nine subspecies of leopard, including the African Leopard. While there’s a lot of variety in appearance among leopards, even among subspecies, they are famous for their sleek, spotted coats. How can you tell a leopard from other spotted cats, like jaguars and cheetahs? Well, to start, jaguars are found in South America – not Africa. They’re also larger and more muscular than leopards and their coats have a larger rosette pattern with spots in the center. Cheetahs are found in similar geographic areas to leopards but are easy to identify based on appearance. Cheetahs are substantially smaller than leopards and much faster over short distances. (In fact, cheetahs are the fastest land animals.) Their coats have true spots, compared to a leopard’s rosette pattern. While jaguars are listed as “Near Threatened”, cheetahs and leopards are both listed as “Vulnerable”. A recent study found that leopards have lost 75% of their historical habitats worldwide. (This varies by region.) It’s estimated that there are around 100,000 leopards remaining in Africa, and around 10,000 in Asia. Did you know there are actually five species of rhinoceros? Three – the Sumatran, Javan, and greater one-horned rhinos – reside in Asia, with the latter two critically endangered. Two – white and black rhinos – live in Africa. Black rhinos are native to eastern and southern Africa but are sadly critically endangered. Between 1960 and 1995 the population of black rhinos dropped by 98%. But, there is hope. Conservation efforts over the last two decades have helped to bring black rhinos back from the brink of extinction, with the population increasing from 2,500 to over 5,000. There’s an even greater success story when it comes to the white rhino. Once near extinction, it’s now estimated that there are around 20,000 white rhinos. They mostly reside in southern Africa. However, the subspecies of the northern white rhino has not fared so well. You may have read recently that the northern white rhino is now extinct in the wild. In March of 2018, the last male northern white rhino died. African elephants can be found in 37 different countries in Africa. There are actually two distinct species of African elephants: African forest elephants and African bush elephants. African forest elephants are found in the forests of Gabon, surrounding the Congo Basic. African bush elephants live in Sub-Saharan Africa. While they typically reside in grasslands and plains, you can find them almost anywhere—including deserts, beaches, mountains, and forests. African forest elephants are smaller than both African bush elephants and Indian elephants. Male African forest elephants usually range from 2.7 to 6 tonnes in weight, and reach around eight feet tall, while male African bush elephants can weigh up to 10 tonnes and grow up to 13 feet in height. African forest elephants have straighter, more downward-pointing tusks, compared to the African bush elephant’s curved tusks. A forest elephant’s trunk is hairier than a bush elephant’s, and their ears are smaller and rounder. Both species of African elephants are listed as vulnerable. The population of African forest elephants, which is around 100,000, is particularly struggling to recover from poaching due to the species’ lower birth rate. Unlike the rest of the Big Five, the Cape buffalo is not vulnerable or endangered. These massive bovines usually reach three to six feet in height and weigh anywhere from 1,000 to 2,200 pounds. Although the Cape buffalo is not necessarily the most famous of the Big Five, they were considered by hunters to be extremely dangerous. Beyond the Big Five, there’s a lot more to explore when it comes to African wildlife. South Africa alone is home to nearly 300 species of mammals! As mentioned in our section on leopards, cheetahs are small, fast, spotted cats. They live in the grasslands of sub-Saharan Africa. Due to their diminished population, they’re even more elusive to spot during a safari than leopards are. Giraffes are among the most popular, and most easily spotted African animals. They’re social creatures that move in groups, and are active all day long, making them relatively easy to sight. And what a sight they are! Giraffes can be up to almost twenty feet tall. They live in the Savanna and woodlands across the African continent, stretching from South Africa to as far north as Chad. In recent years, poaching and habitat loss have led to giraffes being listed as “Vulnerable” for the first time. Zebras are easy to spot on safari thanks to their eye-catching black and white striped coats. These equids are related to horses and donkeys, but unlike their relatives have never been domesticated. Did you know there are different types of zebras? In fact, there are three species of zebra. Grévy's and mountain zebras are endangered, while plains zebras are much more plentiful and widespread. Each can be identified by their stripes, among other attributes. Grévy's have thin stripes and are largest, mountain zebras have bold stripes with a horizontal pattern on their legs, and plains zebras are smallest with “shadow stripes” and few stripes on their legs. Due to their differing habitats, you won’t see gorillas during a traditional safari. There are two species of gorilla, eastern and western. Within those groups, the habitats of each subspecies vary greatly. Gorillas typically live in troops in either lowland tropical rainforests, or mountain forests, in central Africa. You’re likely to see a hippopotamus while on safari in Africa, although typically in the water. The semiaquatic animals hang out in the rivers and lakes of sub-Saharan Africa. Hippos are the third-largest land mammals (after elephants and rhinos), weighing in at over 3,000 pounds. Is the hippopotamus Africa’s deadliest animal? The massive herbivore is responsible for more human deaths per year than any other large animal in Africa. However, the true definition of “deadliest animal” remains up for debate, as a compelling case can be made for the tiny, malaria-carrying mosquito. Whether it’s taking the appropriate medications, or keeping your distance from wildlife, it’s always a good idea to follow common safety practices when traveling abroad. In South Africa, “Springbok” can refer to two things: its national animal, or its national rugby team. The animal is a graceful, medium-sized antelope found in southwestern and southern Africa. On safari, you’ll find springboks most active either at dawn or dusk. There’s no threat to the survival of springboks – in fact, they’re one of the few species of antelope whose population is increasing – and you’ll often see it on the menu at game restaurants. Crocodiles are found across the globe, including in much of Africa. The slender-snouted crocodile is found in freshwater habitats throughout central and western Africa’s tropical forests, while the larger and more aggressive Nile crocodile lives in fresh and brackish water throughout sub-Saharan Africa. The dwarf crocodile, smallest of all living crocodiles, lives in western Africa’s tropical forests. Like the hippopotamus, the crocodile makes most lists of Africa’s most dangerous animals and contributes to some human deaths each year. As always with unpredictable wildlife, it’s best to keep a safe distance! The African continent is home to many different species of snakes, including the black mamba—famous for its speed, aggression, and venom. There are well over 2,000 species of birds found in Africa, with more than two-thirds of them being endemic to the continent. One of them is the ostrich, the world’s largest living bird. A trip to Africa is a life-changing experience, and from it, you’ll take away some incredible memories. Be sure to savor each moment – during your safari, take the time to truly understand and appreciate how special it is to be in the company of these incredible animals. That said, “pics or it didn’t happen”, right? The best camera is the one you know how to use. Investing in a fancy camera (and a good zoom lens) will only help you take great pictures if you know how to use it. Before you leave for your trip, practice and become familiar with the lenses and settings. If you’re more comfortable using the camera on your smartphone, do so! Timing is everything. Morning and evening are the best times to spot wildlife, and it’s when natural light is at its best. Take advantage of that beautiful golden hour glow. Have an eye for the eye. If you really want your African wildlife photos to stand out, try to get on eye level with your subject. Then, focus your shot on the animal’s eye. Stay sharp. Expect wildlife to be on the move and adjust your shutter speed to avoid blurry images. Shooting on an iPhone? Try shooting in burst mode so that you’ll have several images to choose among, or use iPhone’s Live Photo feature to grab the exact right moment. Shoot then think. When you spot an animal you want to photograph, grab your shot before you do anything else. Animals move quickly and you don’t want to miss what may be your only opportunity to snap a photo. Then, take more time for your second shot. Consider the framing, your foreground and background, and the rule of thirds. If time (and your subject) allows, your second shot will be the winner. During your African cruise with Azamara, you’ll be able to partake in some amazing shore excursions that will introduce you to some of Africa’s most interesting animal residents: elephants, cheetahs, giraffes, and more! If your voyage calls on Mombasa, Kenya, consider joining our Cruise Global, Stay Local shore excursion to the Maasai Mara National Reserve. This region is known for its lions, leopards, elephants, and hippos. You’ll get to enjoy both morning and afternoon safaris during this excursion, maximizing the likelihood of seeing these majestic animals! Safari shore excursions are available in many of our African ports-of-call including Port Elizabeth and Richards Bay, both in South Africa. In Port Elizabeth, you can’t go wrong by visiting the Sibuya Game Reserve, the Pumba Private Game Reserve, or the Addo Elephant Park, if spotting wildlife is at the top of your wishlist. In Richards Bay, the Hluhluwe-Imfolozi Private Game Reserve or Thula Thula Game Reserve are perfect for anyone interested in getting to know the local wildlife. Check out the Adventure Local, Eco Local, and Stay Local shore excursions offered in Africa here, and get a taste for what your journey to Africa could include! When you cruise to Africa with us, you can (and should!) book a pre- or post-cruise safari. When you’re traveling all the way to Africa, you certainly will want to make the most out of your trip! With our Micato Safaris Land and Sea Packages, we’ve made it easy as 1-2-3 to book the ultimate African adventure. Micato brings more than 50 years of experience to safari travel, and they’ll make sure every detail is taken care of. This five-night journey will take you to Victoria Falls, one of the Seven Natural Wonders of the World. Talk about checking something off the bucket list! In Botswana, Chobe National Park will be a main attraction. It’s known for having one of the greatest concentrations of wildlife, and particularly of elephants, in all of Africa. The park is also home to giraffes, lions, buffalo, antelope, rhinos, zebras, cheetahs, and much more. Also five nights long, this journey is perfect for foodies! It kicks off in Cape Town’s wine region, then takes you to the Kapama Private Game Reserve, located between South Africa’s famous Kruger National Park and the Blyde River Valley. Kapama’s 13,000 hectares of African bush is home to more than 40 different kinds of mammals, including the Big Five, and 350 different kinds of birds. Donate to a reputable wildlife conservation organization, like the World Wildlife Fund (an Azamara Club Cruises partner), the African Wildlife Foundation, or the Jane Goodall Institute. Don’t support products that come from poaching, or support trophy hunting. Book safaris with trustworthy companies, or through a trusted source. Cruising to Africa with Azamara makes planning everything from urban excursions to Savanna safaris a breeze! You’ll rest easy knowing that you’re getting the best of the best when it comes to every experience. These voyages are where luxury meets adventure – will we see you there?